I’m on record many times as being in favor of a purely objective selection criteria. However, when it comes to seeding, things are a bit trickier. While selection is a purely binary process–you’re either in or you’re out–all teams are intertwined when it comes to seeding. I’ve previously offered up an alternative where teams are selected by their resume, but seeded by their true strength. While this balances the bracket correctly, it completely abandons the reward-based nature of the tournament, which we’d like to preserve as much as possible. There is no system to both perfectly reward teams for their body of work and preserve the integrity of the bracket so that higher-seeded teams are never given a tougher draw than a team seeded lower than them. Every time you move a team to help with bracket integrity for one team, you by definition hurt another. Despite this impediment to perfection, we can do better than either a purely reward-based or a purely quality-based seeding system. It necessarily involves trade offs, and you have to balance maintaining the reward for some teams against hurting/helping others. Every year around this time, the 350+ Division I basketball teams wrap up their regular seasons and–save for the 32 conference champions who receive automatic bids–leave their fates in the hands of the aptly-named Selection Committee. Later today, this committee will finish pouring over each team to select the 36 at-large teams to complete the field of 68. It’s a supposedly painstaking process that takes many days and long nights for the committee members to arrive at their selections. It’s also completely unnecessary. Actually, worse than that. It’s detrimental to the process. I’m here to tell you why. All conference tournament predictions are now in. You can follow along with this year’s contest by using this google spreadsheet link: predictions. TeamRankings currently holds a commanding lead and is trying to win their 3rd Conference Tournament Predictions Contest. Final results to be posted once all the games are completed. I’m once again tracking conference tournament predictions between my own system, KenPom, and TeamRankings. I discuss the scoring system in this post, but essentially for each team result that actually happens (e.g. Loyola wins the MVC, Indiana loses in the 2nd Round, etc.) we grade the predictions based on how likely they thought that result was to happen, punishing predictions more severely the less likely a system predicted it to happen. You can follow along with this year’s contest by using this google spreadsheet link: predictions. In the very early going, TeamRankings is off to an early lead, followed by my Predict the Madness system, and then Ken Pomeroy’s in 3rd. I will try to post another update early next week once all of the conference tournament brackets have been set. Until then, enjoy the early conference tournament action! Before I get to this year’s predictions, I realized I never posted last year’s final results, but my predictions did pull out the victory, narrowly holding off a strong TeamRankings run. KenPom finished 3rd. It’s been an especially impressive run for TeamRankings, who has 2 first-place finishes and 3 second-place finishes, while never finishing in last. The full results (Google spreadsheet) can be viewed by clicking here. As I’ve done for most of the last few seasons (I missed 2014 for some reason), I’m tracking conference tournament predictions between Ken Pomeroy, Team Rankings, and myself. In the previous 4 years I’ve tracked, Team Rankings has 2 victories to 1 each for both KenPom and my own predictions. Now that all the conference tournament fields have been set, here are the full predictions for all 3 systems this year (with results through Sunday): predictions. I discuss the scoring system in this post, but essentially for each team result that actually happens (e.g. Loyola wins the MVC, Indiana loses in the 2nd Round, etc.) we grade the predictions based on how likely they thought that result was to happen, punishing predictions more severely the less likely a system predicted it to happen. In the early going, it’s my Predict the Madness system that is off to a strong start, but there are still a lot of games to be played as the majority of conferences will kick off tournament play this week. I’ll be back early next week with the final results. Last week, I posted the predictions for the 13 early tournaments. Now the other 19 (that’s right, the Ivy League has joined the party) tournaments are set and most are underway, so I’ve updated the Google spreadsheet with all the predictions. KenPom is off to the early lead and looking for his first ever victory in the prestigious Conference Tournament Predictions contest that he doesn’t know he’s in. TeamRankings, the two-time champion, is in 2nd place, while my predictions (the reigning champs!) are trailing the pack. Thirteen of the conference tournaments kick off early and are all under way. With the lone exception of the America East tournament, they will conclude early as well beginning with the Ohio Valley on Saturday and ending with the Patriot league title on Wednesday. The rest of the tournaments kick off next Monday or after and conclude either next Saturday or on Selection Sunday itself including the first ever Ivy League tournament. As I’ve done in years past (2013, 2015, 2016), I’ll be tracking my conference tournament predictions against those of both KenPom and Team Rankings. The predictions for the early tournaments are up here on Google drive and I’ll add the remaining tournaments in once their brackets are set. But while we wait and see how the projections will fare, I want to explain what my rooting interests will be during Championship Week. Today, the NCAA Selection Committee put out their first ever in-season preview, releasing the current top 16 if the season were to end today. Let’s see how they did. 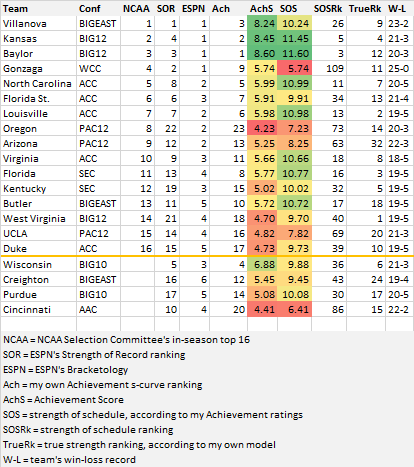 First, here is their s-curve alongside my own Achievement Rankings, ESPN’s Strength of Record rankings, and ESPN’s current bracketology seeds.